A mini muffin tin is your best friend when it comes to making snack-able finger foods for game day, family gatherings, or parties. These scrumptious Chicken Enchilada Cups offer crunchy, cheesy, saucy goodness in every bite! 1. Preheat oven to 350°F. 1. 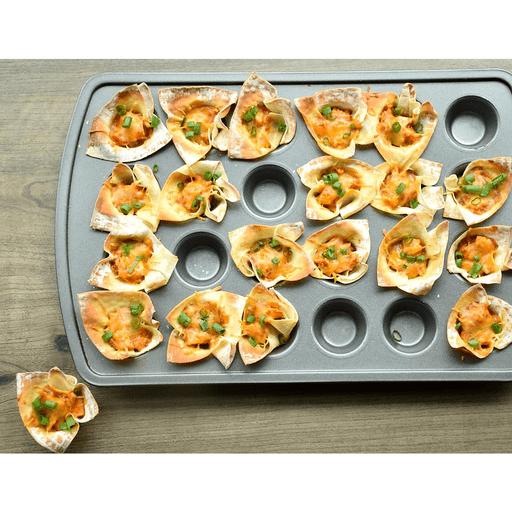 Press wonton wrappers into the cups of a mini muffin pan to form cups, being sure that the edges do not fold in. Bake for 7 minutes, then remove. 1. Meanwhile, stir together chicken and enchilada sauce in a mixing bowl until combined. Portion the chicken evenly into the baked wonton cups until they are full. Sprinkle each with a pinch of shredded cheese. Then bake for an additional 5-7 minutes, or until the cheese is melted and the chicken is heated through. 1. Remove and garnish with sliced green onions and any additional desired toppings. Top with chopped green chiles, black beans, chopped fresh cilantro and diced avocado. Calories 60, Total Fat 1.5g (Saturated 0.5g, Trans 0g), Cholesterol 15mg, Sodium 150mg, Total Carbohydrate 5g (Dietary Fiber 0g, Sugars 0g), Protein 6g, Vitamin A 2%, Vitamin C 2%, Calcium 6%, Iron 2% *Nutritional values are an approximation. Actual nutritional values may vary due to preparation techniques, variations related to suppliers, regional and seasonal differences, or rounding.